DeGRAFF – Shady Bowl Speedway had a night of close races as five divisions took to the rural oval Saturday. 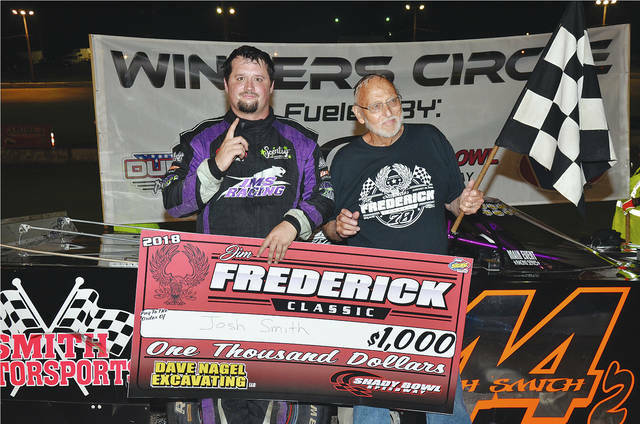 Shady Bowl hosted long-time racer Jim Frederick and his family and friends for the running of the Frederick Classic. The race was a 40-lap feature for the Dave Nagel Excavating Late Models. Matt Jackson led the first counter before giving way to Kenny George. George, driving a car owned by Frederick, held the lead for the next 13 laps. Points leader Josh Smith of Quincy ran down George and took the lead. Smith was never able to build a big lead, however, as Jacob Muncy put extreme pressure on Smith as the laps wound down. Smith took the checkered in his CS&SS LLC backed ride with Muncy right on his bumper for second. Mike Ward was lurking in third waiting for a mistake from the lead two that never came. Jim Lewis Jr. and Nic Burnside finished fourth and fifth. Smith set quick time with Ward winning the dash. Jackson and Ward won heat races. The Biggins Small Engine Repair Modifieds took to the track for a 30-lap feature. Mike Carroll took advantage of his front-row starting spot to lead the first eight laps. Columbus driver Sean MacNealy ran down and passed Carroll to take over the lead. MacNealy had been running strong all season but a feature win had evaded him. MacNealy had to figure it was all over as fast qualifier Greg Stapleton caught him. MacNealy stayed cool in his M&M Head Service and held off Stapleton to take his first Shady Bowl feature win. Stapleton finished second. Carroll, Buddy Townsend and Chris Parker rounded out the top five. Daniel McPherson won the dash, with MacNealy winning the heat. The 25-lap street stock feature was perhaps the best race of the night. Jim Lewis Jr. motored out front at the drop of the green flag. Lewis held the first four laps before yielding to points leader Rodney Roush. Roush, a six-time track champion, led until Josh Sage was scored as the leader on lap 19. Roush regained the lead on lap 20 setting the stage for five laps of thrilling action. The duo battled back and forth with the checkered showing the closest finish, with Roush winning by .004 seconds. Jason Mahaffey carried the checkered for the dash, with Scott Sullenberger and Tim Hines winning heat races. Jacob Muncy was fast qualifier. Rob Schaeff won the DeGraff Service Center Hard Charger Award. The 20-lap Buckeye FWD Mini Stocks looked like another win for Justin Pope after he took the lead from Ryan Tamburro on lap four. Pope, however, was disqualified as his car failed a post- race inspection. The win then went to Piqua’s Mike Wintrow. Tamburro held on for second, with Corey Plunkett third, Josh Foltz fourth and Jimmy Huffman fifth. Foltz won the dash, with Austin Eaton and Levi Frazier winning heats. Jason Purtee’s seven-race winning streak came to an end in the Hangar 18 Race Cars Hobby Stocks. Andy Pine led the first three laps before Steve Fowler took the lead. Fowler and fast qualifier Purtee battled in a paint-swapping duel before Fowler took the win in the 10-lap main. The win was the first for Fowler in the Abbott Auto Center Monte Carlo. Purtee was second, with Les Rhodes third, Rob Fogt fourth and Pine fifth. Fowler, Purtee and Pine split the Hangar 18/Xfactor Hard Charger Award. Jordan South raced his way to the championship in the spectator drags. This Saturday will see the track honor the memory of Shawn Stansell of Dayton. Stansell ran #96 for most of his career. thus the street stocks will run a 96-lap feature. Stansell posted wins in the street stocks, late models and modifieds during his career. Sadly, he died in a highway accident during the off-season. The Biggins Small Engine Repair Modifieds, the Hangar 18 Race Cars Hobby Stocks and the Buckeye FWD Mini Stocks will also do battle. Racing will begin at 7 p.m.